What does a Secondary Sump Containment do to help you stay compliant? When housing chemical storage, hazardous materials or hazardous materials waste, it is necessary that a secondary sump containment is present in your storage container. A secondary sump containment provides protection in the event of a chemical spill or leak and contains the excess hazmat. The purpose of the sump containment is to catch spilled chemicals, either in liquid or solid form and contain them in order to prevent a hazardous situation. US Chemical Storage has been devoted to keeping your hazardous materials and chemical storage safe and compliant since 1983. Providing you with the strongest and most durable chemical storage buildings – trusted worldwide. All of our chemical storage buildings feature a leak-proof secondary sump containment in order to contain chemical leaks or chemical spills. Our experienced engineers understand the importance of having a sump containment and what size the sump containment should be. Our chemical storage buildings are built to handle large volumes of chemical storage, and all of our buildings are 100% customizable to meet your exact specifications. We offer many different types of flooring options to meet your chemical storage needs. Illustrated below are three separate types of flooring to optimize your chemical storage building for complete compliance. Our stainless steel diamond plated flooring is one of the strongest and most reliable flooring options available. The diamond plate flooring is an easy to clean surface and provides a durable non-slip top coat. Stain resistant and extremely durable. Our diamond plate floor will not chip, or peel. Rust resistant and corrosion resistant for maximum protection. Keep your chemical storage safe and secure with our extremely strong diamond plate flooring. Customize your chemical storage building with our forklift rated flooring option. Giving you the accessibility to use your forklift while loading, unloading and organizing your chemical storage inventory. Our forklift rated flooring provides a capacity of 12,000 pounds for heavy forklift operations (customizable for all applications). The forklift rated flooring is coated with chemical resistant primer and HIGRIP topcoat for ultimate protection from chemical interaction and maximum durability purposes. Customize your forklift rated flooring with US Chemical Storage – and stay 100% compliant. The fiberglass floor grating T-Bar type option is made with a fire-retardant vinyl-ester resin and provides a corrosion resistant construction. 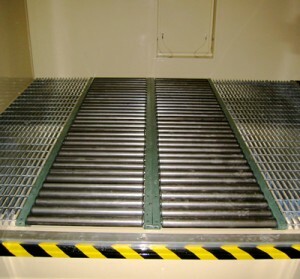 The fiberglass floor grating comes with an ultraviolet resistant construction and features an extremely stiff construction when choosing floor grating for chemical storage applications. 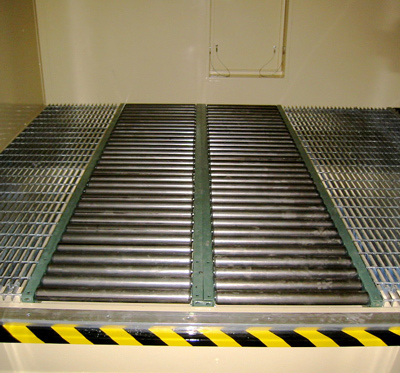 The fiberglass floor grating is impact resistant and allows for an open area for a chemical spill or leak. Request a quote or call one of our experienced professional sales engineers to learn more about our wide variety of compliant flooring options today!